North America was the largest region in the it services market in 2017, accounting for 33% market share. Western Europe was the second largest region accounting for 33% market share. Africa was the smallest region accounting for 1% market share. Over the past five years, cloud software solutions have been gaining acceptance from companies across all industries. Cloud is a software delivery method where a vendor hosts a software application in a remote server and customers can access it through the internet. Cloud software solutions are widely used in customer relationship management (CRM), HR/payroll, project management and accounting software systems. For example, Vodafone is utilizing Salesforce.com’s software services to make connections through social media. North America was the largest region in the global IT services market in 2017, accounting for more than one-third of the market share. This was mainly due to high investments in IT infrastructure, demand for efficient management of IT services, and increasing adoption of IT services in Small and Medium-sized Enterprises (SMEs). 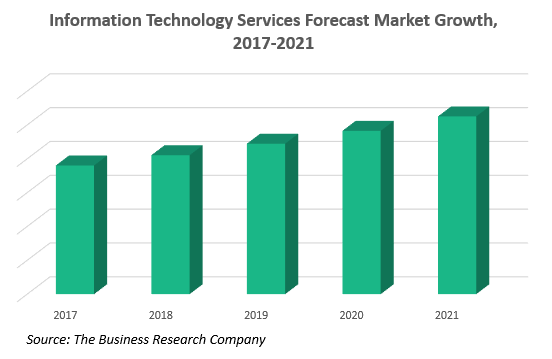 The chart below shows the year-on-year growth of the global information technology services market during 2017 – 2021. According to The Business Research Company’s Consultant, Oliver Guirdham, data analytics is the transformation of raw data into useful information. It is used across all industries to find out key information from raw data for better decision making. It examines large amounts data to find out correlation and hidden pattern that may directly or indirectly affect business. Major companies across different industries are using data analytics tools. Data analytics are specific to the industry. Information technology companies are offering customized data analytics tools based upon the functioning and demand of its client. For example, the City of Toulouse in France is using IBM social media analytics platform to identify and prioritize citizen’s issues. Microsoft was the largest player in the information technology services market, with revenues of $90 billion in 2016. Microsoft’s growth strategy aims at focusing on mobile and cloud solutions; it also targeted having a billion subscribers for Windows 10 by 2018. The IT services market is segmented into Software and BPO Services market; Hardware Support Services market; and Cloud Services market. Hardware Support Services may be either be a reactive support, preventive-based support, or proactive support. Hardware support services are predominantly sold as maintenance contracts, which extend up to one to three-year duration. Hardware support services includes computer and peripherals support services, storage and servers support services, networking support services and others. Software and BPO Services include application software programming services, computer program (software) development, computer software support services and web design services. Customers for software services include commercial establishments operating in manufacturing, telecoms, fast moving consumer goods (FMCG) verticals and other industries and government organizations. Cloud Services refers to delivery of information technology resources and applications on-demand through the Internet platform. Companies in the cloud services industry provide access to servers, storage, databases and a broad set of application services managed by a hardware networking. Information Technology Services Global Market Report 2018 is a detailed report giving a unique insight into this market. The report is priced at $6000 for an individual user. To use across your office, the price is $9000 and $12000 if you wish to use across a multinational company.